Half ounce vials, each comes with three charcoal briquettes. 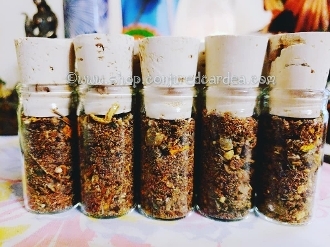 This incense is created with only the finest resins and herbs; dark copal, benzoin, dragon's blood, pinon, cardamom, clove, deer's tongue, marigold, sunflower, wormwood, mullien and pomegranate zest. Created to conjure your guides and spirits and aid in manifesting your goals and divinations.